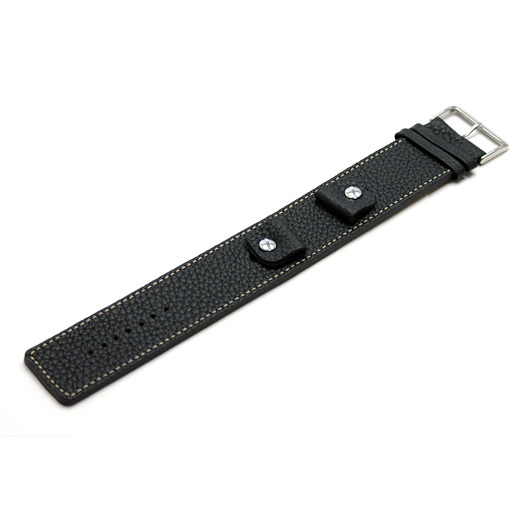 Finest Quality, hand made in Germany using a fifty step process and with a keen attention to detail, this textured one piece black calf leather watch strap is 'cuff' style with adjustable riveted fixings and rice coloured detail stitching. This strap can be used with either conventional or fixed spring bars. It is rugged alternative to standard open-end straps, and suitable for sports, pilot / aviator or chronograph watches. 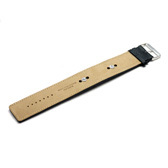 This strap will fit any watch were the distance between the lugs is 14mm, 16mm, 18mm or 20mm (depending on the strap you buy). Like all of our products, it is brand new and in stock in the UK, ready for our super fast shipping.